Instant Pot Hearty Chicken Soup - Fast & Easy Ready When You Need It! Hearty Chicken Soup is the BEST when made in the Instant Pot! It’s easy, fast and soul-warming with little effort on your part. The past two weeks have been crazy in my world. Both of my kids have had birthdays (a week apart). My husband has been traveling. The kids each have had a virus (of course different viruses and at different times), as it seems most of their classmates have as well. I thought I avoided whatever they each had, then after a night of only 5 hours sleep I woke up with that familiar feeling; I was getting sick! Ug. Who has time for that?! Whenever anyone in my house begins to come down with a bug I make chicken soup. Does that make me sound like a Grandmother? Possibly, but there are studies done by reputable medical establishments that lend credence to consumption of chicken soup helping a cold! When I’m getting sick myself the last thing I want to do is cook. If I was more plan-ful I’d always keep some homemade chicken soup in the freezer for such an occasion. But guess what? I now have an INSTANT POT which is just as good if not better. I was able to whip up a batch of Instant Pot Hearty Chicken Soup even while feeling miserable (it was so easy). I always have the ingredients for a basic soup on hand in my kitchen. The holy trinity of vegetables, onion, carrots and celery, is what you need to add dimension to chicken stock in a soup. When I’m making my chicken soup for a cold I add lots of garlic, ginger, and apple cider vinegar too which have great healing qualities to them. Jalapeno chile peppers too (I think getting a sweat going is a good thing). I have a conventional recipe I make, War On A Cold Homemade Chicken Soup, which I make a bit differently each time. For that recipe, I use a whole fryer. 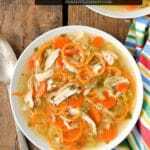 For this Instant Pot Hearty Chicken Soup I use boneless chicken breasts. Timesaving TIP alert! They cook with the soup and then are removed, shredded (I have a fantastic trick to shred chicken in about 30 seconds with no mess), returned to the pot. Another trick I use, especially when I’m under the weather, is instead of hand chopping or slicing all the vegetables I use a 3-cup mini electric chopper. I throw everything that is going to be cooked together in at the same time; in this case, all the vegetables (I sliced the jalapeno but you can put that in there too). Give a whirl and with no effort, all your vegetables are prepared. I was able to prepare everything and sauté the vegetables in less than 5 minutes. I set the soup up, using the SOUP setting, lay down and within 30 minutes it was ready and I kept it warm in the Instant Pot all day. 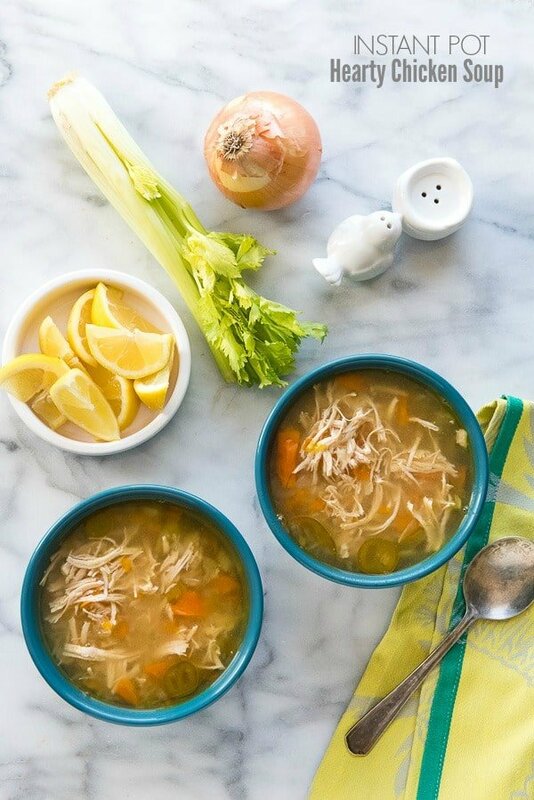 You don’t have to be sick to enjoy this hearty chicken soup certainly. You can also change up the flavors easily by adding herbs, putting in some potatoes at the end (or noodles or rice) and cooking for a few extra minutes. It’s a perfect base soup and very comforting on its own too. Homemade chicken soup is always soothing. Between the familiar aroma and the comforting taste, it warms any day. It is something I make whenever a family member is coming down with a cold. Making it in the Instant Pot with a few tricks makes it effortless. Freeze any excess in a freezer-safe container leaving an inch at the top for expansion when frozen. 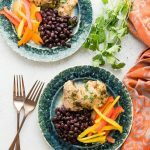 All recipe steps are done in the Instant Pot making clean up a breeze! Using the saute function, the onions, carrots, celery, jalapeno peppers and garlic are cooked for about 3 minutes. 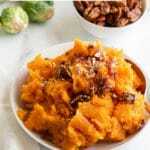 The remaining ingredients are added to the Instant Pot and cooked using the SOUP setting to develop wonderful flavors! When done, the chicken is shredded with forks or using this trick and added back to the soup. Salt and pepper to taste and serve! 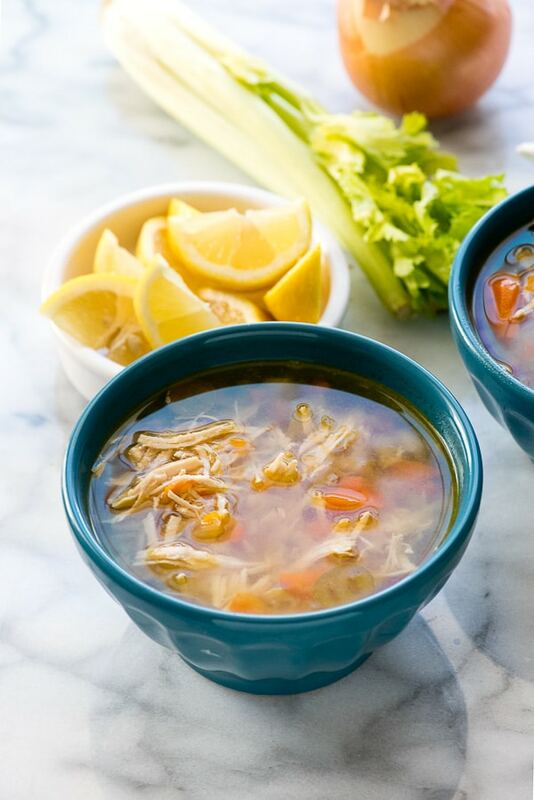 If you’ve tried this Instant Pot Hearty Chicken Soup or any other recipe on BoulderLocavore.com please don’t forget to rate the recipe and let me know where you found it in the comments below, I love hearing from you! You can also FOLLOW ME FACEBOOK, TWITTER, INSTAGRAM and PINTEREST to see more delicious food and what I’m up to! 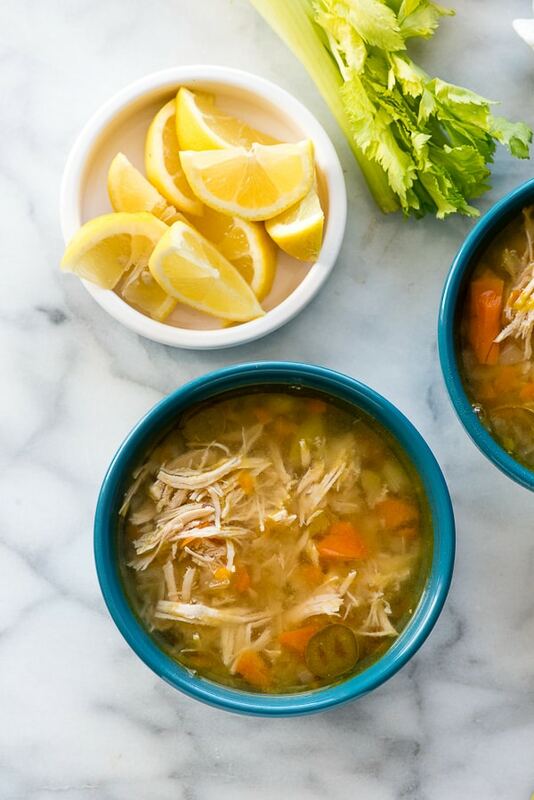 Making Instant Pot Hearty Chicken Soup with a few tricks makes it effortless. Freeze any excess in a freezer-safe container leaving an inch at the top for expansion when frozen. Select SAUTE on the Instant Pot and add the olive oil. When the oil has heated add the carrots, celery, onions, garlic, jalapeno and ginger. Saute until the onions begin to turn translucent (about 3 minutes). Add the chicken stock, water, apple cider vinegar and chicken breasts. Close/secure the lid, set release valve to SEALING and select the SOUP setting. When the soup cycle is done, release the pressure and remove the chicken breasts with tongs. Use this quick trick to shred the chicken in 30 seconds with no mess or by pulling apart the chicken with forks. Add the shredded chicken back to the soup, salt and pepper to taste and serve. This looks amazing! I’ll be making it soon. One question: what amount is one serving? Thank you. 1 cup equals 1 serving! My apologies, I’ve updated the recipe to make that more clear; thanks so much for asking! Living here in the Midwest, the weather changes from day to day. 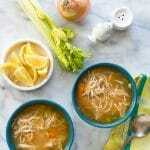 This soup looks and sounds perfect for those days when the weather turns colder! I love it! That’s our story in Colorado most definitely; this year especially. It seems to be cycling between snow and 80 degrees with no warning! Can never go wrong with chicken soup, instant makes it all the better when you’re pushed for time! I seriously need to get one of those instant pots. They sound so handy! I mean, look at that delicious soup! in my opinion, this is the perfect meal! I love homemade chicken soup, it really does make you feel better! I need to get an instant pot. I am loving all the recipes I see for it! I love having soup when I’m feeling under the weather and it’s what I also give the kids. 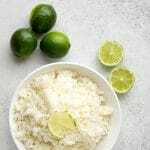 I think this is a lovely recipe, I appreciate that it’s quick and easy to make. Just looking at these pictures warms my soul! My mom makes amazing chicken soup and this has me craving some! Yours looks amazing!